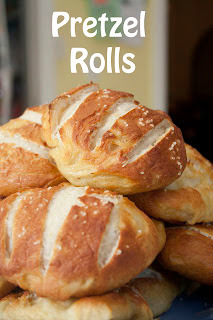 These rolls are awesome! I came across these a while back on pinterest and have made them a couple times since. The original blog post is from Une Bonne Vie, but they are so yummy I had to a share! The first time I made them I am pretty sure I had at least 3 at dinner because they are quite addicting. Nathan has decided they are better then soft pretzels and should be eaten with cheese sauce; the girls wanted butter on theirs. Eli and I were happy with them just as they were. Before I get into the recipe let me just say I do not claim to be a baker, but I always end up needing more flour. Maybe my kitchen is too warm or maybe I just don't know what I am doing, but they are still really tasty. I can only imagine how great they would be if made by someone who knows what they are doing. Start by mixing the yeast and warm milk (I had mine between 110 and 115). Set that aside for 10 minutes to rest. Whisk 5 3/4 C flour and salt in a large bowl. Add canola oil and warm water to yeast mixture. Pour into bowl with flour and salt. Knead in bowl until the dough is mostly soft. Only add enough flour so dough is easily handled. Dough will be somewhat stiff. Cover and allow to rise 1 hour. Punch down and knead 1 minute. Cut in 15 pieces (or however many it takes to get the size rolls you want) and form into balls. Place on greased surface and let rise 15 minutes. In the meantime prepare bath by bringing water, salt, and baking soda to a rolling boil and preheat oven to 400 degrees. Place 3 rolls in the bath and poach for 1 minute. Place on well greased baking sheet and cut 2-3 lines across the top of poached rolls. Sprinkle with sea salt and bake for 20-25 minutes. These are best the day they are made (but still very tasty the day after)! Enjoy!